Astronomical Clock in Prague | Travel? Yes Please! Prague, with all its medieval charm and beauty, is a main attraction in and of itself. The city has so much to offer adoring visitors, but it’s a clock that attracts some of the biggest crowds, stealing the show at the top of every hour. Hundreds of visitors gather around Prague’s astronomical clock to see this masterpiece welcome in the new hour with great fanfare. As soon as the clock chimes, the crowd, in unison, raises their cameras up to capture the mechanical performance. Soon, small allegorical figures appear to come to life and begin moving about the clock, signaling the start of a new hour. Prague’s astronomical clock is only the third oldest of its kind in the world, but it’s the oldest one that’s still in working order. The mechanical clock and astronomical dial date all the way back to 1410. About 80 years later, the calendar dial and Gothic sculptures were added. The clock stopped working numerous times in the course of its 600 plus years, and saw many repairs and additions. The moving statues were added in the 17th century, and the figures of the Apostles were added around 1865. The astronomical clock in Prague is made up of three main parts: the astronomical dial, the calendar dial and the “Walk of the Apostles”. Watching the clock perform was fun to see, but it’s hard to have a deep appreciation for it until you understand the complexities of how it works. The astronomical dial is quite fascinating in that it displays the current position of the Sun and Moon, as seen on the clock hands. It’s complicated on first glance, but once our guide explained it, we had a much better idea of what we were looking at. First of all, the dial’s background represents the earth and the view of the sky. Directly in the centre, is a green circle showing the earth. The blue portion above the earth represents the sky that is above the horizon. Underneath the earth, you will see a red and black area. This represents the part of the sky below the horizon. If you visit the clock during the day time, the sun will be over the blue part. At night, the sun sits over the black, showing it’s below horizon. The Roman numerals on the background are there to show the local time. The position of the golden hand over the Roman numerals indicates the time in Prague. Inside the dial, surrounding the earth, is a black moveable circle marked with the signs of the zodiac. This ring shows the current location of the sun, on the path it follows throughout the course of a year. The movement of the moon also corresponds to its path on the ecliptic. The zodiac signs are shown on the ring in counterclockwise order. 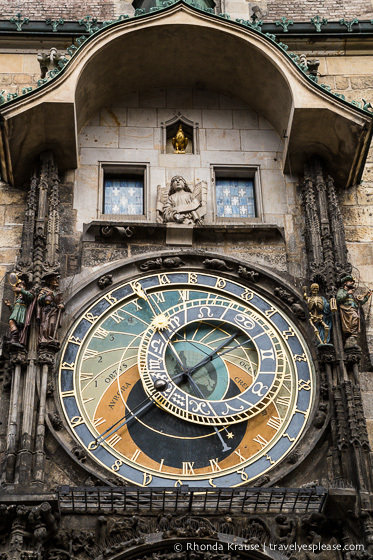 Completing the astronomical dial, is a ring of numbers that indicate Old Czech Time. The numerals 1-24 are set on a black background at the outer edge of the clock. Twenty-four indicates the time of sunset. Since sunset varies from season to season, this ring is able to turn in order to match the time of the sunset. The calendar dial, built by Josef Mánes, was added to the clock tower in 1865. It shows the days of the year along with medallions which represent the 12 months. Above the clock are two little doorways, which open up at the top of the hour. Small statues of the Apostles parade out the doorway and then enter back in the other side. When the Apostles finish their journey, the golden rooster above them crows, the bell rings and the clock chimes the hour. As a nice touch, this is followed by a trumpet player heralding in the hour from the top of the tower. The four figures flanking the clock are also set in motion every hour. These allegorical figures represent some of the things that were despised at the time the clock was made- vanity, greed, death. At the far left is Vanity, shown by a man gazing at himself in the mirror. Next to him stands Greed, a man holding a bag of gold. On the right hand side of the clock is the skeleton of Death, striking his bell on the hour. Lastly, is a figure of a Turk, holding what I think is a mandolin. I’m not sure what he is supposed to represent, but the Turk can be seen shaking his head, along with the other figures, at Death. Here is a video of the astronomical clock in Prague ringing in the hour. 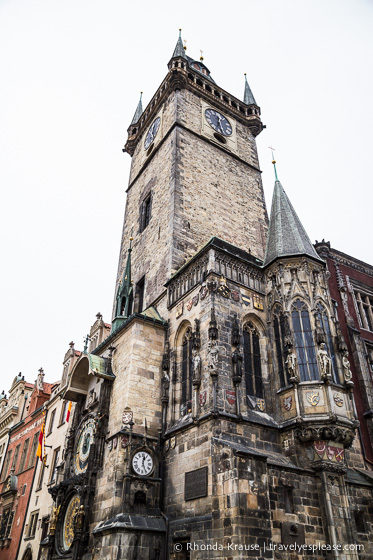 The clock can be found on the southern wall of Old Town City Hall in Prague’s Old Town Square. The Apostles of the astronomical clock are in operation from 9:00 am to 11:00 pm. Keep your belongings close during the clock’s performance. Many people all huddled together, distracted by the show, makes the perfect setting for pickpockets to do their thing.